Balzam po holení s jedinečným zložením granátového jablka a vitamínov. Stará sa o pokožku, vyživuje a napomáha chrániť pred podráždením spôsobeným holiacou čepeľou. Ponúka pocit mäkkosti, omladenia a sviežosti. Ingrediencie: Aqua (Water), Alcohol Denat, Dimethicone, Glycerin, PEG-12 Dimethicone, Bis-PEG-18 Methyl Ether Dimethyl Silane, Caprylyl Methicone, Parfum (Frangrance), Helianthus Anuus (Sunflower) Seed Oil, Panthenol, Argania Spinosa Kernel (Argan) Oil, Olea Euroopaea (Olive*) Fruit Oil, Tocopherol, Prunus Amygdalus Dulcis (Sweet Almond) Oil, Aloe Barbadensis Extract, Punica Granatum Fruit Extract, Rosmarinus Officinalis (Rosemary) LeafExtract, Allantoin, Salicornia Herbacea Extract, Ascorbyl Palmitate, Xanthan Gum, Caprylic/Capric Triglyceride, Hydroxyethyl Acrylate/Sodium Acryloyldimethyl Turate Copolymer, Disodium EDTA, Tocopheryl Acetate, Linoleic Acid, Phenoxyetanol, Hydroxyisohexyl 3-Cyclohexene Carboxaldehyde, Linalool, Limonene, Alpha-Isomethyl Ionene, Benzyl Benzoate. After shave cream. It is a unique formula with pomegranate and vitamins. 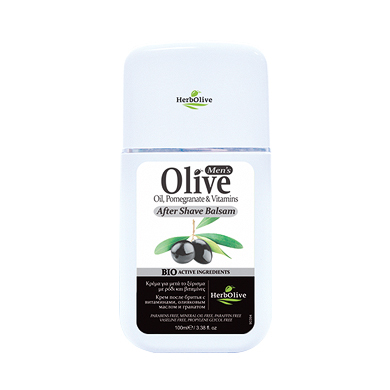 It cares for the skin, it nourishes and protects it from the irritations caused from the shaving blade. It offers a sensation of softness, rejuvenation and freshness.